The wisdom tooth is the third (last) permanent molar in the upper or lower jaw. 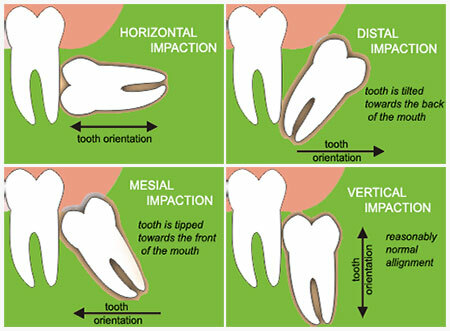 It is called wisdom tooth because it usually erupts from the age of 16 onwards, normally considered the ‘age of wisdom’. Most adults have four wisdom teeth but it is possible to have more. This is a wisdom tooth that is obstructed from erupting fully into the mouth by adjacent neighbouring molar or surrounding bone or soft tissue. infection of the surrounding gum leading to bleeding or pain, swelling, bad breath and gum disease. Such wisdom teeth are usually removed to improve the overall oral hygiene of the patient and to save the neighbouring teeth. Occasionally, erupting wisdom teeth may exert pressure on the adjacent teeth causing erosion or overcrowding of the dentition. Impacted wisdom tooth can also cause other serious problems like cystic changes or dental tumour development around them. Cysts or dental tumour can destroy the surrounding bone or neighbouring tooth. Wisdom tooth problems are usually silent at their onset. Even a pain-free wisdom tooth can have sub-clinical infection with bone loss for many years before they become painful. At Coden Specialists, our internationally experienced oral & maxillofacial surgeons will be glad to have a discussion with you on how you can remove your wisdom teeth efficiently and with minimal discomfort.